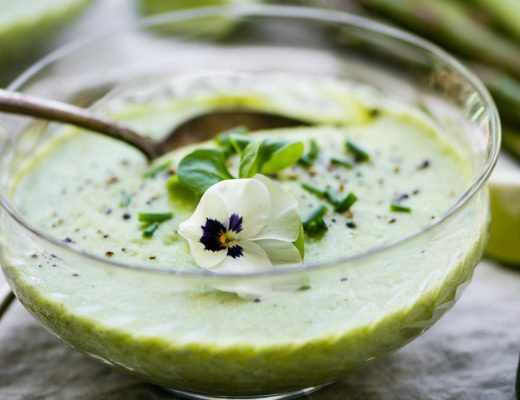 Fresh Basil Hummus is a vibrant version of the traditional Middle Eastern bean dip, infused with lots of leafy green basil. It’s gorgeous, super healthy, and really delicious served with warm pita bread. Hummus is so fantastic that sometimes it feels like a sacrilege to mess with it. And I already have so many great variations on the blog. But this was such a hit with everyone who tried it that I have to share. To be honest I surprised myself with this one. We bought basil hummus from our favorite Middle Eastern stand at the farmer’s market a couple of weeks ago and I wasn’t impressed. It had sort of a ‘canned’ flavor, not good. But once again, just making something yourself at home can make such a difference…two big fistfuls of beautiful fresh basil and a shot of lemon and I’ve got something so much better than anything I’ve ever bought, or ordered. The basil comes through with a really fresh clean flavor, and it reminds me of the huge difference between homemade and store bought pesto. We ate our hummus with Grant’s signature seasoned baked pita chips. He doesn’t make many things in the kitchen, but these are a family favorite, and we all fight over them. He usually seasons his chips with just onion salt, but I added za’atar, a Middle Eastern herb blend that you may be able to find at your store. You can also buy it online, or make it a good substitute yourself by grinding dried thyme, sumac, salt and sesame seeds together. 101 Cookbooks has a good recipe, here. You can substitute dried thyme or oregano in a pinch. Drain and rinse the chickpeas. Put them in the bowl of a food processor along with the smashed garlic clove. Process the chickpeas for several minutes, stopping to scrape down the sides of the bowl as necessary. I like to process the beans first to get them as smooth as possible. Add the tahini and lemon to the puree and process briefly to combine. Then add the basil, and process for another couple of minutes, scraping down the sides as needed. You want it to be really smooth. Wile the machine is running, drizzle in some ice water to loosen the hummus. Season with salt and fresh cracked black pepper. 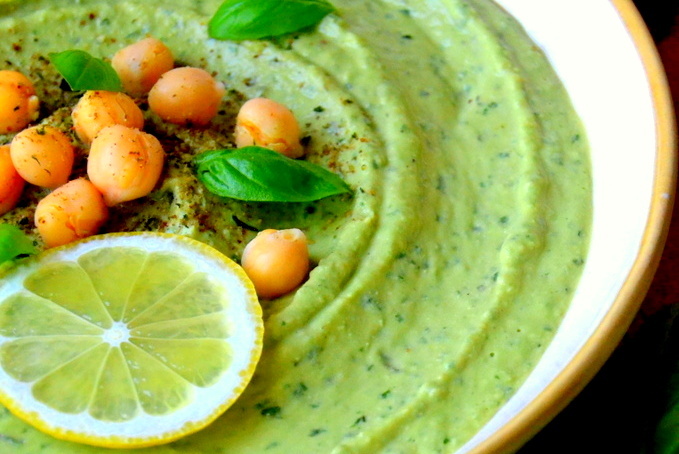 Spread the hummus out into a shallow bowl, cover with plastic wrap, and refrigerate until ready to serve. Serve with a drizzle of olive oil, a sprinkling of za'atar, sumac, or paprika, and a lemon wedge. To make the pita chips, set the oven to 350F. 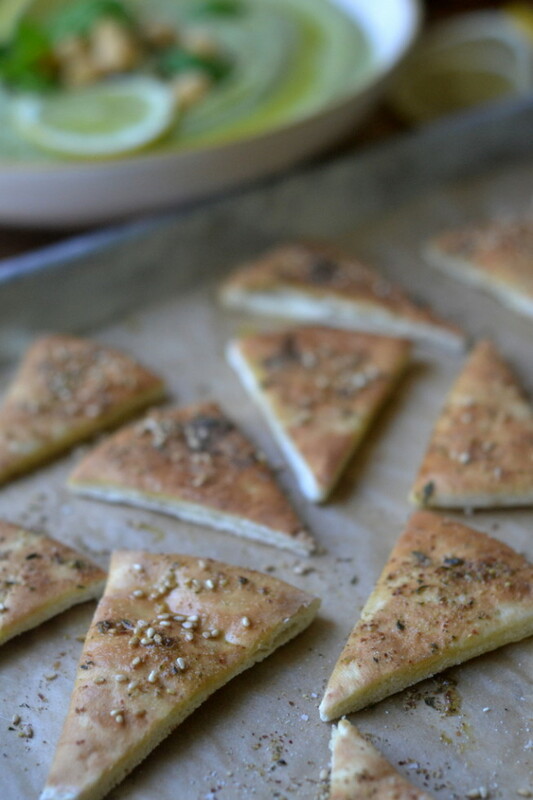 Cut the pita bread in small triangles and arrange on a baking sheet. Brush them with olive oil, and sprinkle lightly with onion salt, z'aatar, and sesame seeds. Bake for just a few minutes, watching carefully, until the bread it browned. Flip the triangles and bake for a few more minutes, but watch carefully. If you want them extra crispy, brush the second side with olive oil as well. Our family just now had a session with this amazing dip. I used Naan cut up and heated in the oven with olive oil and a little sprinkle of salt. I don’t want dinner. I just want to eat the hummus. Delicious!!! Happy 4th of July and thank you. 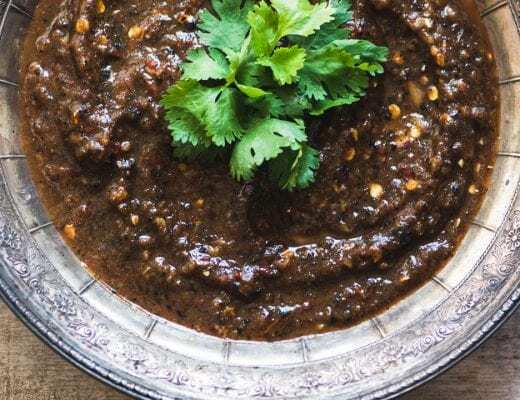 I love hummus and my basil is growing faster than I can use it so I will be trying this recipe asap! You know I love this Sue – the color is amazing. 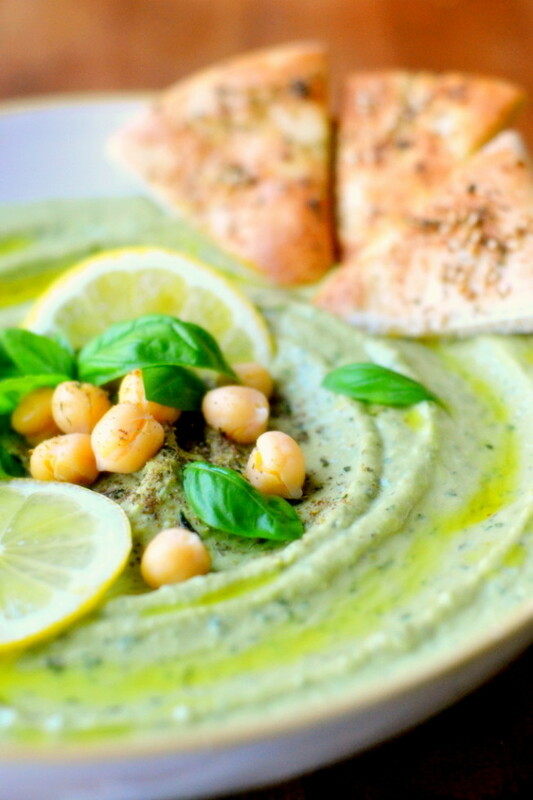 Kind of a combination of basil pesto and hummus – and yes on a sandwich would be wonderful! I didn’t think of that but you’re right, it would be great as a sandwich spread! Hmmm, I just made a batch of garlic hummus tonight and I have a couple of handfuls of basil from the CSA share – I’m thinking they’ll be combined tomorrow! 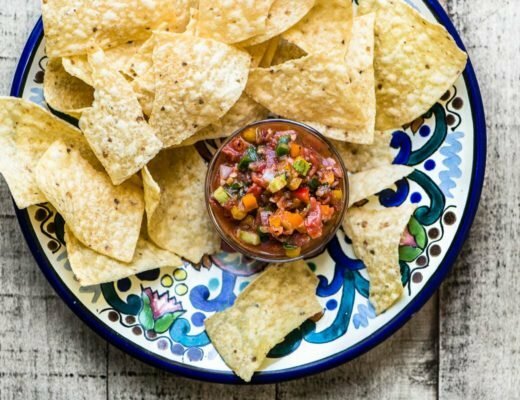 Stacy’s pita chips are my dipping food of choice for hummus and I have thought that I need to make my own. 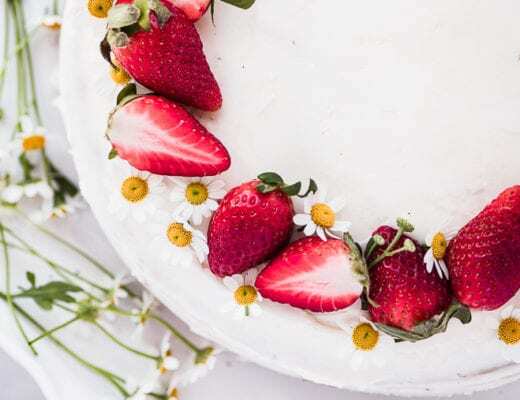 This just might be the perfect post for me – thanks! We used to buy seasoned pita chips all the time, too, you’ll love how easy these are to make, and you can customize the seasonings. So easy – so perfect. Much better than shop bought. In this case there is no comparison with store bought, you just can’t get that fresh basil flavor in pre-packaged form! This hummus sounds fantastic! I bet it would be amazing on a wrap sandwich filled with lots of shredded vegetables and crispy lettuce.